Above is a photo of the myrrh weeping on the Icon of Christ. January 1, 2015 - Reported [here]. Miracle in Fletcher. Rectors at St. Nicholas Russian Orthodox Church claim icon is weeping myrrh. 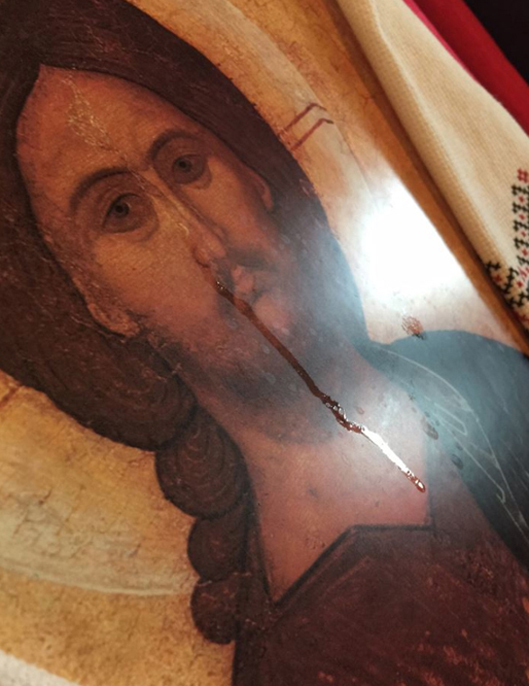 The leaders of St. Nicholas Russian Orthodox Church in Fletcher are claiming that an oily liquid recently began seeping from a wooden church icon. The church’s rector is calling the event a miracle. Father Steven Webb, the church’s rector, reports via the St. Nicholas Russian Orthodox Church’s page on Facebook that on Dec. 18, “the main icon of Christ in the nave began streaming myrrh.” Myrrh is a tree resin and is perhaps best known from a biblical reference as one of the gifts delivered to Jesus on the day of his birth. Even after some myrrh was collected from the stream on the following Monday, a small pool formed shortly after. The icon was then moved to the Holy Table in the Altar. Then on Sunday, December 28th during the Liturgy honoring the Holy Forefathers, myrrh began to stream again during the Beatitudes. This miracle was witnessed by myself, Subdeacon John Cummings, Subdeacon Daniel Franzen, servers Dr. Andy Rudins and his son Alexander. The Myrrh-Streaming Icon of Christ is already drawing faithful who come and venerate the mounted print which is a copy of the Russian Christ “the Savior” original written in the Moscow School style in the 16th century. I have seen streaming icons before, but have never been in the presence of one even as it was streaming. My rational mind has no explanation for what I saw this morning (other than to know that I saw what I saw) and I suspect that if someone interviewed the other four people in the altar, they would get an almost word for word explanation of the events. My spiritual mind knows that it’s not difficult for God to make little drops of (what I suppose is) myrrh appear on an icon of Christ. January 1, 2015 - Reported from St. Nicholas Russian Orthodox Church - Asheville [facebook]. On Thursday evening, December 18th during the hierarchical vigil for the parish feast day officiated by his Grace Bishop George of Mayfield of the Russian Church Outside of Russia, the main icon of Christ in the nave began streaming myrrh at St. Nicholas ROCOR in Fletcher, North Carolina. Even after some myrrh was collected from the stream on the following Monday, a small pool formed shortly after. The icon was then moved to the Holy Table in the Altar. This morning, immediately before the Liturgy, Fr. Steven, Subdeacons Daniel and Andrew, Andrew’s son Alex, and myself were looking at the icon. Being a subdeacon in the Russian Church, I was serving in the altar as I typically do on a Sunday morning. We mentioned how the small stream from the corner of the eye was still there, and a small droplet had formed at the bottom of the stream, about where Christ’s right hand is near the heart (roughly the middle of the icon). We all looked closely at the icon and noted it. Liturgy began. During the reading of the Beatitudes, Fr. Steven looked extremely surprised and began to bend forward to look at the icon. He told us to come and look. What I saw was two streams beginning about 5 inches below the small droplet by His heart. Each had a small droplet of a clear liquid substance and the streams were a couple of inches long. We continued the Beatitudes, made the procession, and by then I saw three streams of the liquid, and mentioned to Fr., “There are three streams”. They were unconnected and each ended in a droplet. As the Liturgy went on, it increased to four streams, each with a droplet, three of which were now at the bottom edge of the icon and were definitely 3 dimensional and were hanging over the edge; held, I suppose, by surface tension. I looked again, and a fifth area appeared, although it was just a small spot. We continued to observe this for the length of the Liturgy, but no more areas appeared. It is to be noted that there were no times during this where there were not at least two people in the altar besides Fr. Steven. I, personally, was never out of sight of the icon with the exception of two times to get the censer, and both times I was in the next area for no more that 8 seconds. The back of the icon was unpainted wood and was clearly visible and had nothing of note about it. We finished Liturgy and the streams remained with the three droplets still hanging onto the bottom edge of the icon. I have seen streaming icons before, but have never been in the presence of one even as it was streaming. My rational mind has no explanation for what I saw this morning (other than to know that I saw what I saw) and I suspect that if someone interviewed the other four people in the altar, they would get an almost word for word explanation of the events. My spiritual mind knows that it’s not difficult for God to make little drops of (what I suppose is) myrrh appear on an icon of Christ." Visit the St. Nicholas Russian Orthodox Church [website] and [facebook].